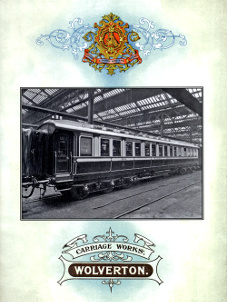 Wolverton works are the largest works entirely devoted to Carriage building and repairs in the United Kingdom. As Carriage Works pure and simple their history dates from 1865, but years before this, in 1838 to be exact, works were erected here by the Directors of the London and Birmingham Railway for the building and repairs of their locomotives, and these works continued as Locomotive Works until 1865. In 1860, the year Mr. R. Bore was appointed Carriage Superintendent at Saltley, it was decided to bring the then somewhat scattered Carriage Department into one large Works, and Wolverton was chosen as the site of the new Works. Hitherto the work had been split up, the building of the carriages being done at Saltley and the repairs at Euston and Crewe. This decision of the Directors necessitated the removal of the Locomotive Works, which were in consequence transferred gradually to Crewe. The work of removal, commenced in 1865, was not completed until 1877, but the Carriage Department was installed here in the former year (1865), as has already been said. Mr. Bore, who came with the Works from Saltley, remained in charge until 1886, when he was succeeded by Mr. C. A. Park, M.I.C.E., the present Superintendent. Since that date the Works have grown almost beyond recognition. The 37 acres of land which they then covered has grown to 80 acres, and the number of hands employed from 2,000 to about 4,500. The more modern shops are built in bays 49 feet wide, and are situated, in the majority of cases, at right angles to the main track. The coaches are run in and out of the shops on traversers, of which there are 9. Four of these are electric traversers, each driven by a 40hp motor, which takes its current from overhead trolly wires. The other five are steam driven.